I love olives. I have always loved them and the story goes that for my two-year birthday a friend of my parents' gave me two olive jars. I was in heaven and did not bother playing with the doll I received as a gift! 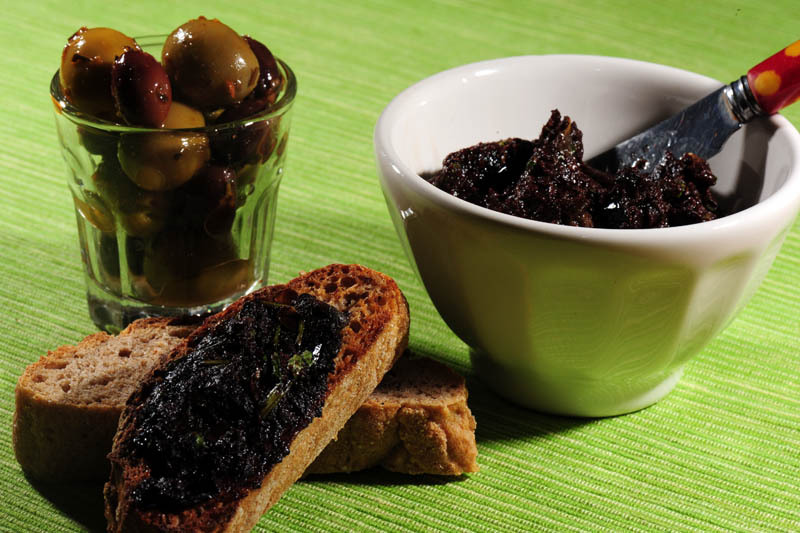 (hint: if you don't know what to bring to our house, good olives are always welcome!). Since we eat olives a lot in our family, my children have developed a good taste for them, including the spicy ones that we find at the supermarket. 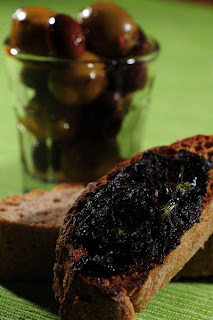 My love for olives made me want to have a perfect Tapenade recipe to eat as an appetizer for our weekly aperitifs or just together with a nice salade composee for nice and relaxed Summer dinner. One that would not be loaded with salt and additives. One that would be smooth enough but with tiny bits of olives. This is not easy. I am not even sure this recipe is my favorite one. Why? Because I have not found the right olives to put into. I tried the cheap version with canned olives (yeah, canned, I know, I know) and it was tasteless. I then went the other extreme where I used cured black olives and that was way too strong (and too salty). Good thing I am in France these days, I'll be able to go and pick the ones I think would make a tapenade perfect. In the meantime, don't complain not to be in France (well, you can), but try to find the right olives near you and don't be disappointed if it does not work out great the first time. Trust me, when it comes to olives, you are on for major discoveries...I am still discovering some and can't wait to try new ones in the years to come!! Bon Appetit! Put all the ingredients in a blender and blend until reaching desirable consistecy. Add salt if needed (it will depend on the capers/anchovies). Serve with crackers, toasted bread. One of the best things we did earlier this year is to join a CSA. We are luck to have a Farmers' Market just across from our building on Sundays. The place was meant for it (used to be one way way way back but only got used as a Farmers' market a few years ago). The farmers have produces that don't compete with what even Wholefoods would offer. We are talking about in-season, fresh (FRESH) produces, most of them organic. So yes, this is kind of our luxury because, let's face it as well, it's not cheap. However when it comes to purchasing veggies on Sunday to have enough to cook for the whole week (meal planning anybody???? ), it's worth investing in good fresh local produces. The two guys we are supporting are called Tom and Matt. I admired their dedication to good produces. While we think we are having a hard time with the heat (who is readin this post in an AC room??? ), Tom and Matt are working their crop to make a living. That's just admirable. Merci Messieurs. I'll have more to talk about Tom and Matt this Summer but one of the first produces we got in May was rhubarb. Lots of fresh rhubarb... so one day I decided to try it on a cake. It turned out to be a good cake, cholesterol-friendly to top it all. My son did declare that he did not really like rhubarb but it was just a one-night-only comment. The next day, he was happy to have another piece of cake! 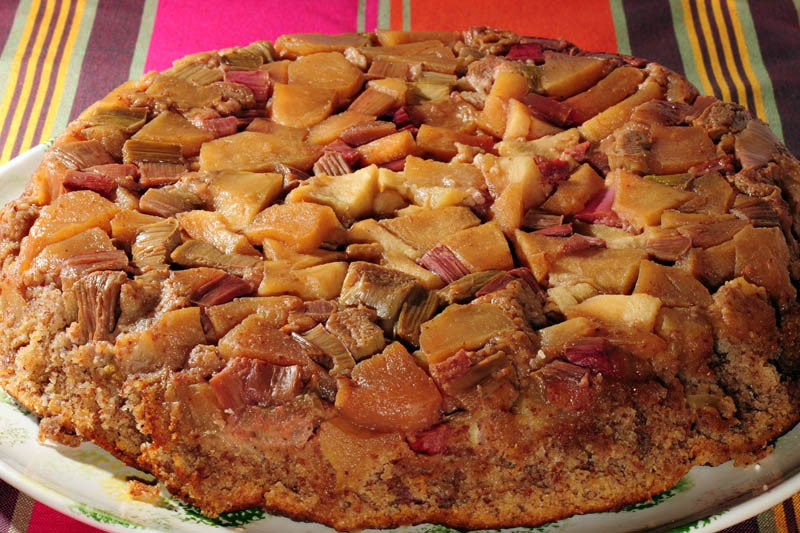 I know that I should have published this recipe when rhubarb was in season. 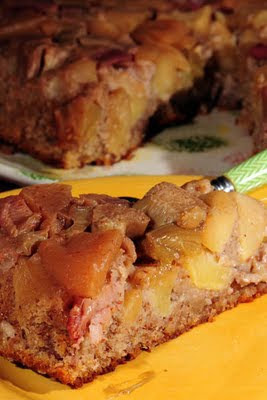 Oh well... you can always use the recipe to bake a cake with peaches these days... I can't wait to get some in my CSA box! As I was driving the kids to school one day, we were behind a camion citerne (tanker) and everytime we are behind one, we play this game of trying to guess what it is inside the tank. I started that game a long time ago, trying to keep my children quiet in the car: it was also a way to make them aware of how things move from point A to point B depending on their physical form. 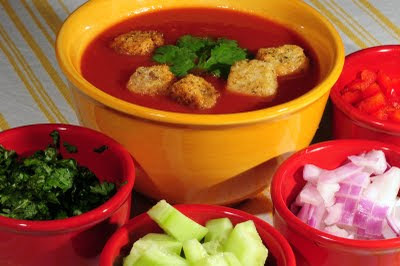 Since it's hot these days, here is a cool non-alcoholic soup for you and your family. My children enjoy eating this gazpacho because they really get to chose the toppings they can eat it with! Worth the extra time to chop extra veggies to put on the table... Bon Appetit! PS: And for those of you who had never had Pisco (a drink originally from Peru but which we discovered in Chile), here is a NY Times article I recently came across! We generally drink it with just lime, crushed ice and powdered sugar... but who knows, in a few years, my kids might add a few cocktail names to their "tanker list!" 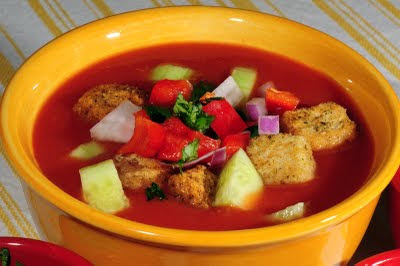 In a bowl, blend the canned tomatoes (including liquid), the fresh tomatoes, cucumber, 1/2 onion and garlic. If I am able to plan ahead, I refrigerate the canned tomatoes overnight so that they are already chilled when I blend them with the other ingredients. If can not plan, put the bowl in an ice-bath while refrigerating it. To peel the fresh tomatoes, drop them for 30s in simmering water.